Sangha Trinational is a transboundary conservation zone of mostly forest landscape. It is centered along the Sangha river, a tributary to the Congo River. The site is home to rare and endangered fauna species, including large ape populations such as the critically endangered Western Lowland Gorilla. 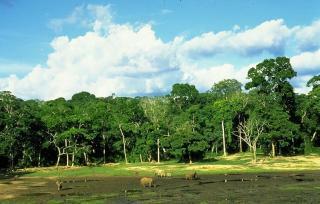 Dzanga-Ndoki National Park in the Central African Republic.